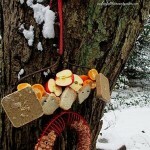 Home » Bird sanctuaries, baths, feeders and more » Birdfeeders ~ Use What You Have! 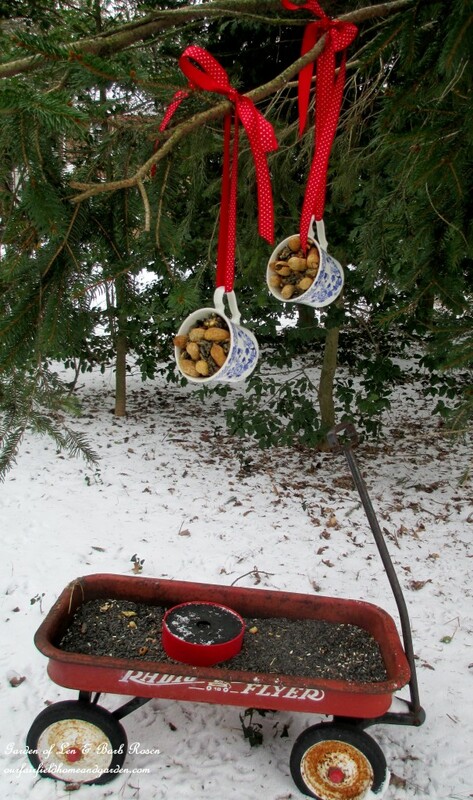 Birdfeeders ~ Use What You Have! 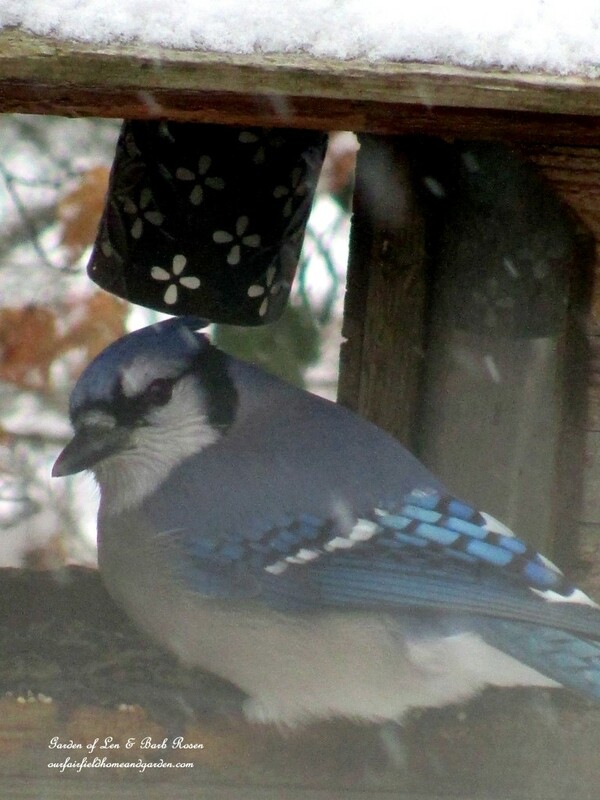 Recently, our weather has been Arctic and I decided to add more feeding stations for the birds who visit our winter garden. Trying to use what is already on hand is a favorite goal of mine. It just so happened that I had picked up a box of blue and white dishes for a song at a sale. As I added them to my collection, I discovered a few of the dishes had a crack or chip. No longer good for serving food, they were perfect for a garden project! My friend, The Empress of Dirt, has a wonderful recipe for Un-Suet Suet, a bird suet made with peanut butter instead of animal fat. Since suet is pricey and messy to render, I decided to use her recipe as inspiration. 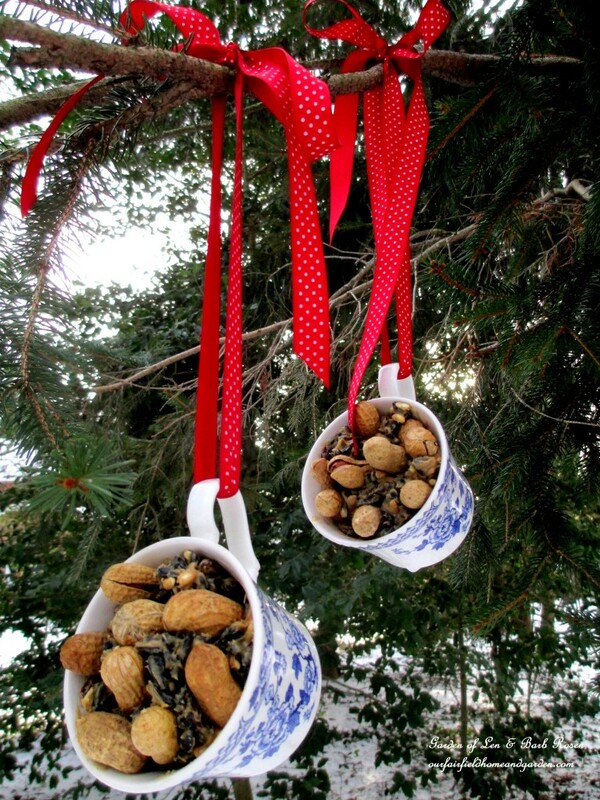 For two teacup feeders I mixed together: 1 cup organic peanut butter, 2 cups sunflower & nut birdseed and 1 cup raisins. Adding other seeds, dried and fresh fruits, you could concoct many different variations! 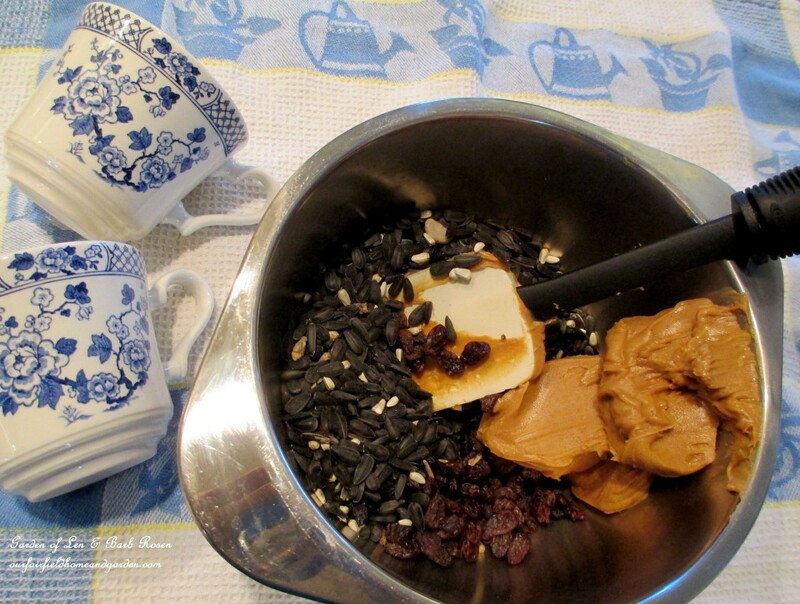 Peanut Butter Suet mix ~ sunflower seeds, raisins, raw nuts and organic peanut butter! 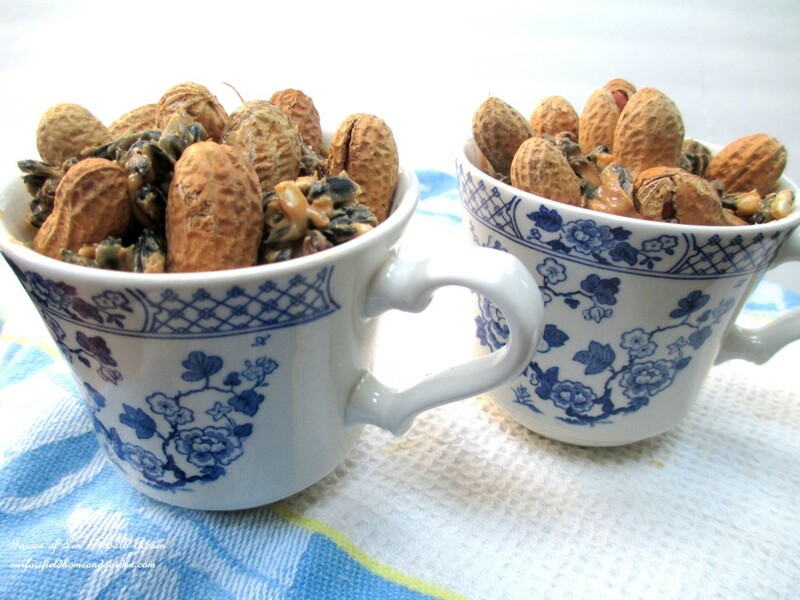 Using a spoon, I packed each teacup with the peanut butter suet mixture and then stuck shelled peanuts on top. A lovely, natural sundae for the birds! Teacups filled with the suet mixture. 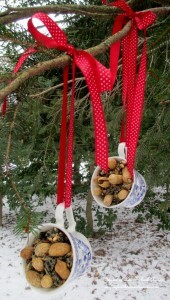 After packing the teacups with peanut butter suet, I rummaged around and found just enough red ribbon to hang them up. I liked the red, white and blue combination against the evergreen branches. While hanging the suet-filled teacups, Lo and Behold! There was my trusty, rusty wagon nearby leaning against the shed! Why not? I pulled it over and put my solar birdbath, peanuts and seed in. Instant birdfeeder! Have you noticed how sometimes things just happen along the way as you do a project? 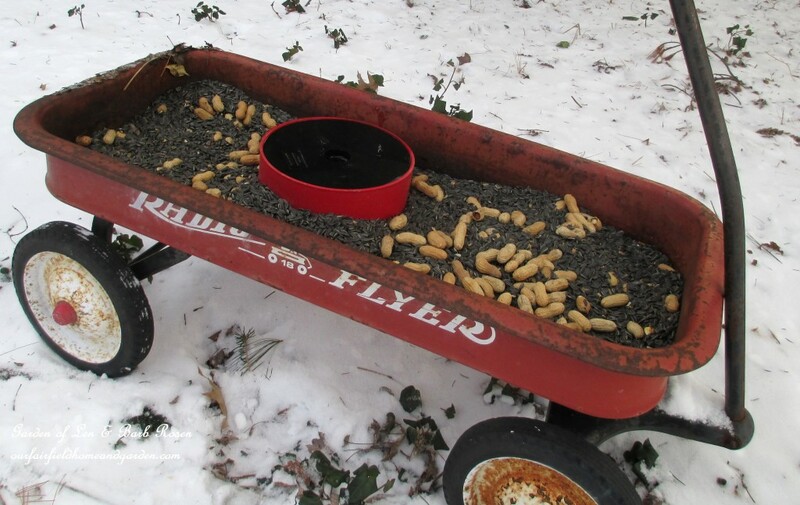 The suet teacups and wagon birdfeeder will provide some additional nourishment for our garden birds during this extra cold snap. Easily refilled or moved, they also bring a cheery spot of color to the dreary winter landscape. 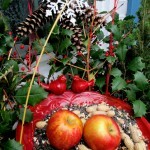 Recycled Birdfeeders ~ a wagon and teacups! 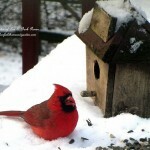 Here are some more birdfeeding posts from Our Fairfield Home and Garden that you might enjoy! So nice of you to feed our feathered friends. Your pics are always interesting and fun to see of the cardinals and other birds that visit you. I had a flock of robins the other day all over my beauty berry bush. I guess they don’t mind their bitter flavor. I made some suet a while back but the mix is a little messy. So a couple of packs are sitting in my freezer. Sunday is supposed to be a little warmer outside so maybe that will be a good day to take it outside. Thanks for the reminder Barb. Glad you stopped by today, Patti! My beauty berry bushes have been stripped clean for months – they are a favorite here too! You are just so creative, Barb! I love these ideas and I’m going to pass this post along to my Hubby who is a real birder – I know he will love these ideas. Great ideas. Always recycle whenever possible. Good thing the birds don’t mind cracked dinnerware! That teacup feeder is adorable. It has been so cold here, I have been keeping the feeders full and trying to keep the water from freezing in the bath, but even the heater has failed the last few days. Hopefully we will get a break in the temperatures, especially for our feathered friends. Great post Barb! Thanks, Amy! You are right, when the temperatures plunge it is a challenge to keep the birds fed and watered. How long until Spring?